Product prices and availability are accurate as of 2019-03-16 06:28:47 EDT and are subject to change. Any price and availability information displayed on http://www.amazon.com/ at the time of purchase will apply to the purchase of this product. 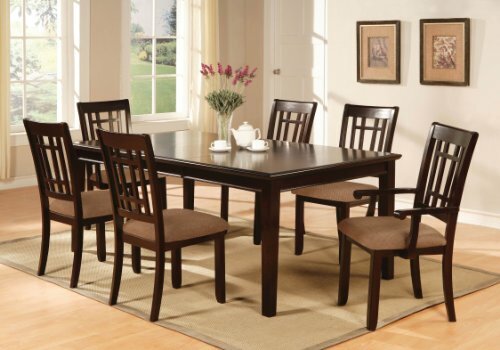 Enjoy your meals on the Madison 7 Piece Dining Table Set. This table offers an 18-inch leaf that helps you keep your dining room free from clutter or to help accommodate your extra guests. Cleaning is quick and easy, simply use water and a non-abrasive cloth to wipe down when needed. Some wood protectants may be used but please use at your own discretion. We highly recommend not to use any harsh chemicals that may damage the finish. Manufactured in Vietnam, some assembly required. Table dimensions: 78" (60" + 1 x 18" Leaf)L x 42"W x 30"H; Arm chair: 20.5"W x 23"D x 39"H; Side chair: 18.5"W x 23"D x 39"H; Seat height: 19.25"; Seat depth: 17.5".